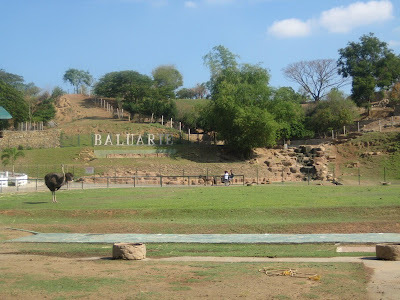 Another long weekend, and it means time to travel.It was a Thursday, April 30, when we took our long ride at Partas bus. The station was packed, I fell in line to buy tickets at 9pm and got my tickets nearly 12am. Before that was not the case. it was easy to get a ticket. 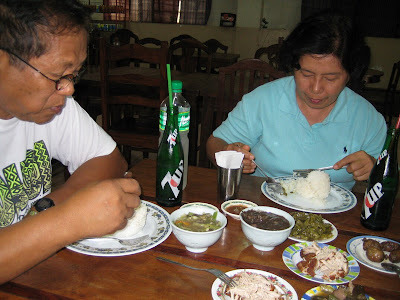 The trip is for my father and mother, I wanted them to be able to go places before they grow too old to do so. hehe. May 1 Day 1 I can never sleep while traveling, so it was a grueling 10 hours for me. We reached Vigan at 9:30 am. 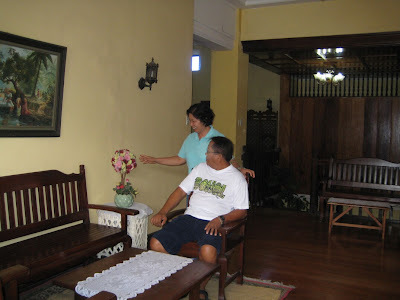 We stayed at Vigan Heritage Mansion, the ancestral house of former Gov. 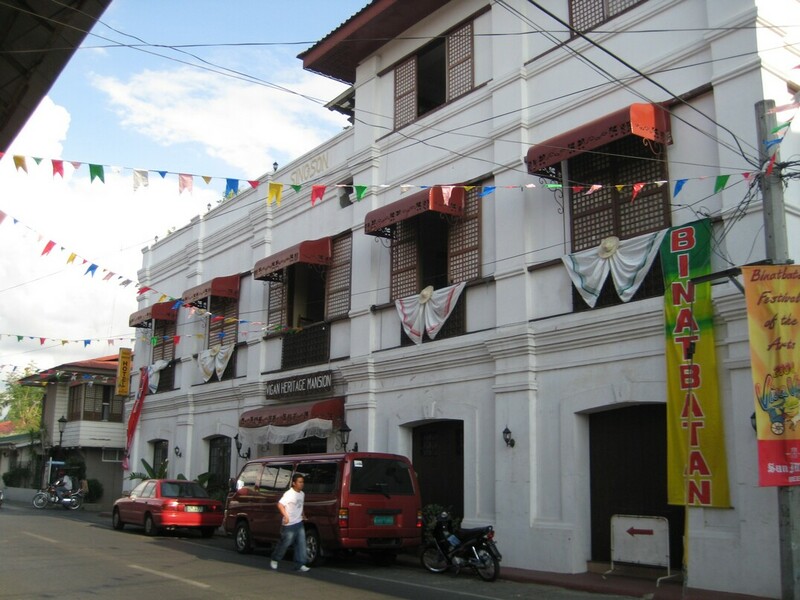 Pedro Singson, which was turned into a hotel by his daughter Julie Singson Manahan. The room is cozy. 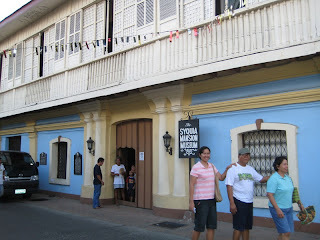 Then we walked along Calle Crisologo, the main street where most of the old structures are. The street is now filled with shops that offers different native products. 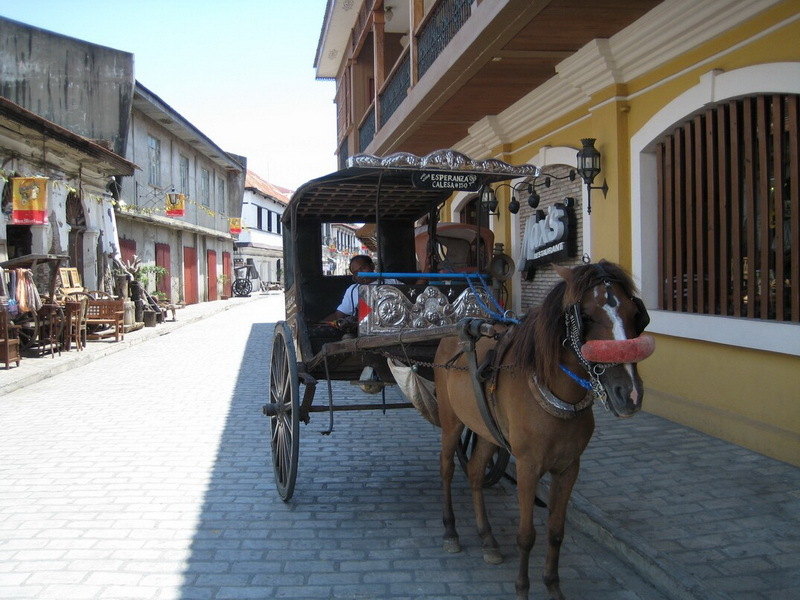 Vigan is also known for antiques. We even spotted a big St.Bernard at the Heritage office. That day, contestants of the art competition are all over Crisologo Street. 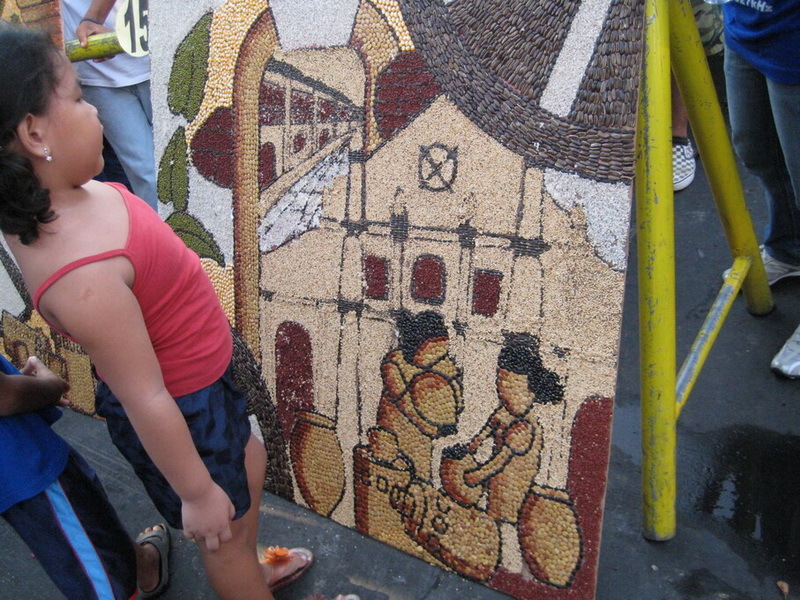 They were using beans, rice and other lentils for their artwork. 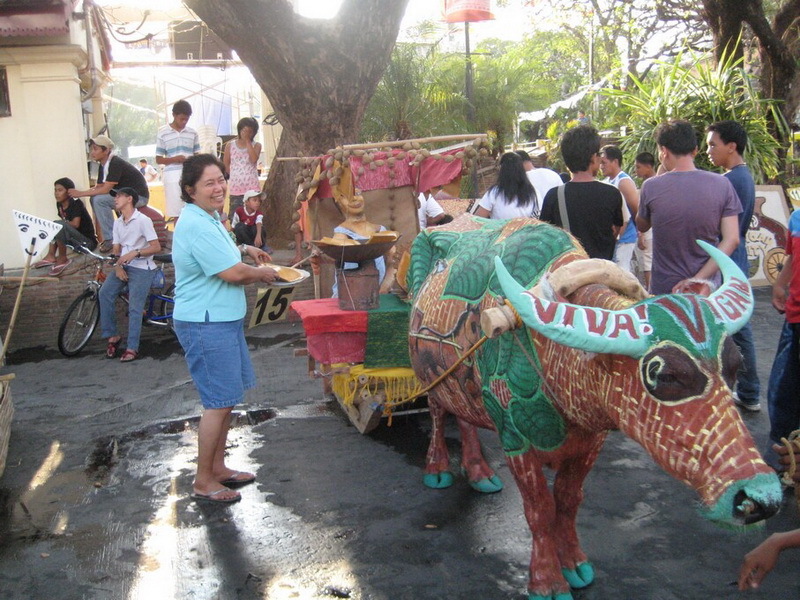 It is the VIVA VIGAN FESTIVAL OF ARTS,so there were lots of activities during our stay there. We ate our brunch at EJ's Restaurant. They offer Ilocano authentic cuisines, like pinakbet, bagnet, longganisa, etc. 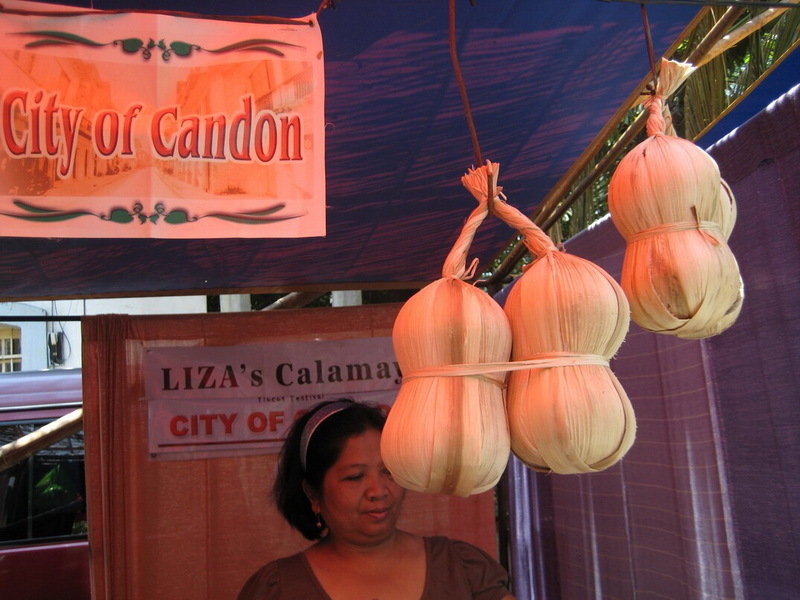 Ilocanos love veggies so they have varieties of cuisine, even a dish using whole peppers. 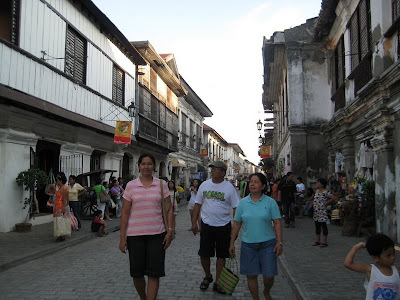 After our meal, we roamed the streets of Vigan again. 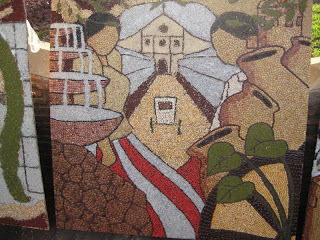 We stopped at Plaza Salcedo, visited the St. Paul Cathedral. 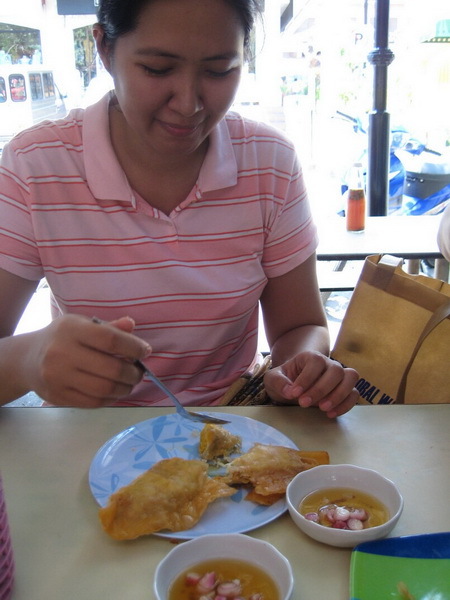 And after which, we ate Vigan authentic snack, which is special Empanada. We went to Burgos Museum but it was closed. We went to the Garden Show, and bazaar selling Ilocano goods. 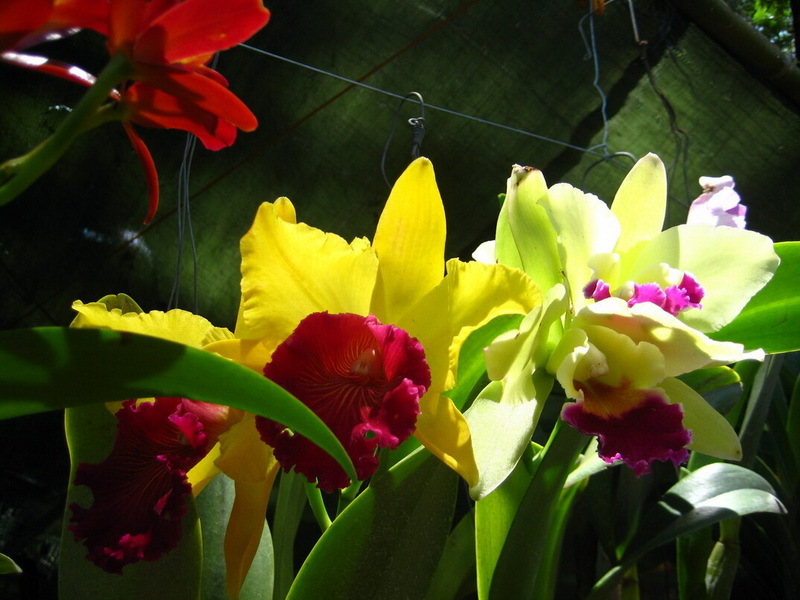 There are arrays of flowering plants, orchids and bromeliads. We even got to see a very old tree, it looks grand. 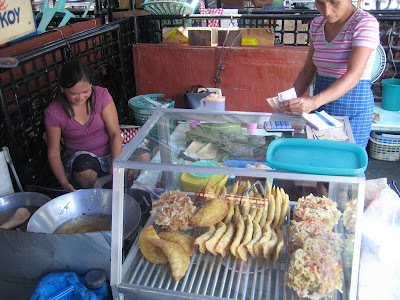 It has a crunchy cover, and the filling is made out of papaya shreds, Longganisa and egg. 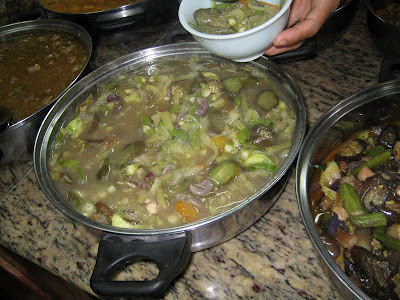 It's great with Sukang Iloco. We went back to the hotel for a short while, through the same street. You will never get tired of Crisologo Street. It's filled with so many interesting things. We even stopped over a small nook, showing the works of their local architect who was the one who restores the buildings. That same afternoon we visited the Crisologo museum, also an ancestral house of the late Congressman Floro Crisologo. He is an interesting man. He had done so much for the people during his years of service. But sadly, he was assassinated inside the cathedral, because of politics. 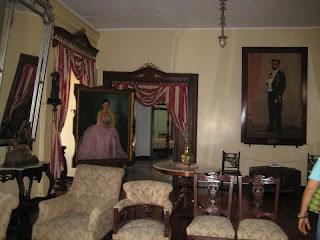 We also visited the grand Syquia Mansion. The home of the late President Elpidio Quirino's wife.It houses beautiful antique furnishings which came from different parts of the world. 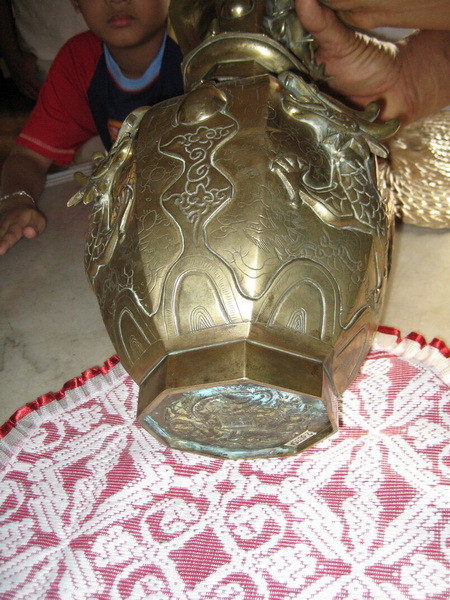 I loved the marble Taj Mahal replica, and the jars which was given to him by the last emperor of China. It has the emperor's seal at its bottom. The house also has interesting architecture, from the peeping holes to the secret doors. Sadly, a few months back, one of the heads of the Santo was stolen, so now they locked all the religious artifacts in a room and installed vibration alerts. 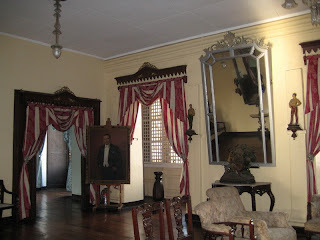 The house never felt eerie. 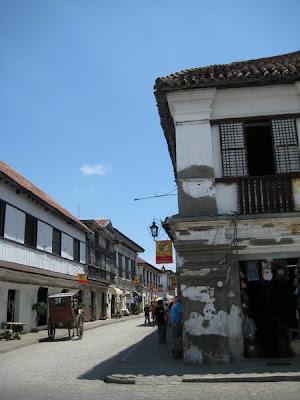 That is what I love about Vigan, the structures do not exude dark eerie feeling. It just feels as if we were transported to the past. 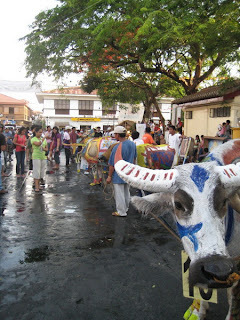 When we went back to the Plaza Burgos, we were greeted by lines of colorful Carabaos. 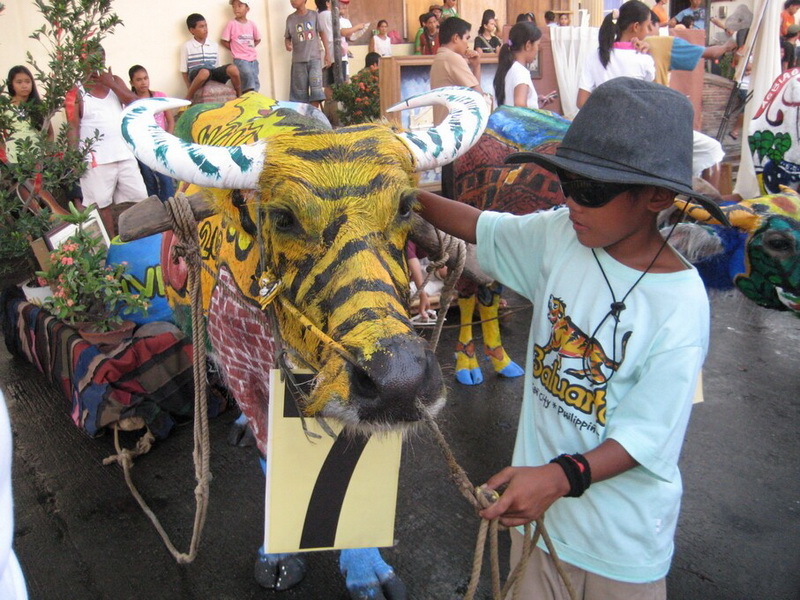 They painted each carabao and hoped to win the cash price. It was so cool looking at them. It's quite unique. 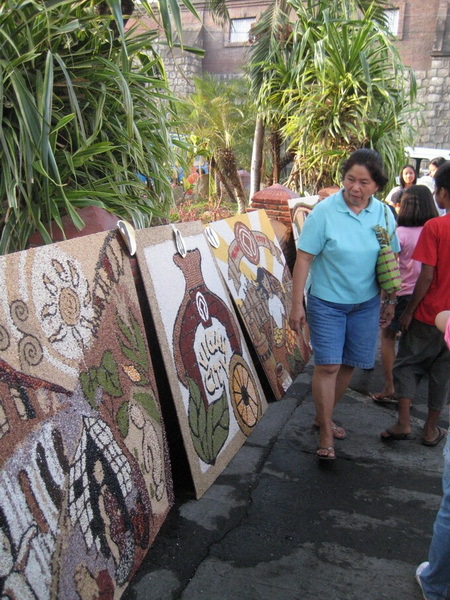 They also displayed along the streets the finished artworks. They are very interesting. We returned to the Garden show, because my sister was compelled to buy a rare kind of dessert rose. Just for fun, we even got to take our pics at the City hall's balcony. That night we ate Inihaw at the main street, then it drizzled a bit. The cobbled stone shimmered. It was a different scene at night. It was my second time there in Vigan, the first time was I was with my bro and uncle, we even got to have our pictures taken at Zaguan. 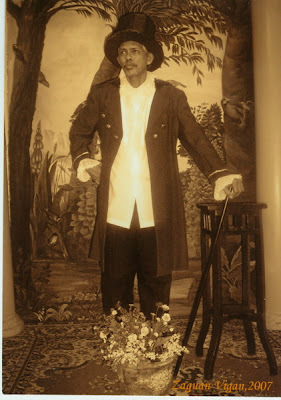 With full outfits of the Spanish era. 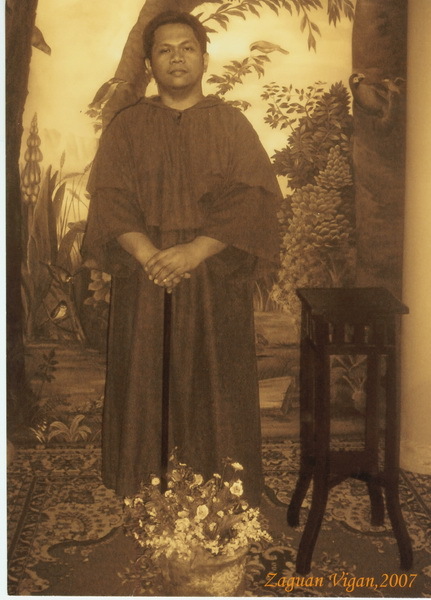 It was fun, like playing dress up. 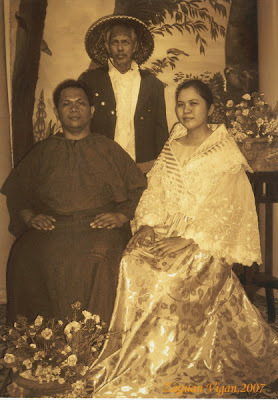 My uncle really looked like an authentic haciendero, because of his Spanish look. 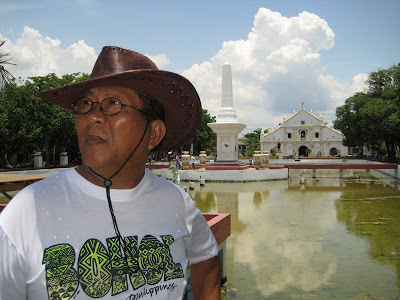 I got to see Burgos museum back then which is nearby the jail house which is pretty scary. We even went to the loom weaving center, where we saw how they create fabrics known as Abel. May 2 Day 2 We woke up early in the morning, went to Baluarte. It is a zoo, where the animals roam freely. I love the miniature horses. They have, llamas, tigers, a lion, a camel, ostriches and lots of deers. I also love the parrots. They also have an animal show that morning. My father and sis got to ride the powerful miniature horse. We can't stop my sis at the petting zoo. 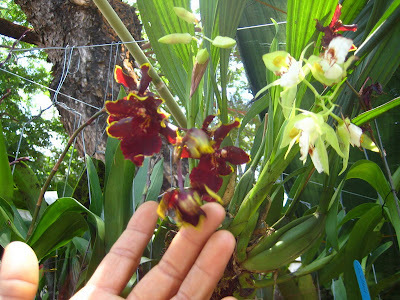 She kept on hugging baby goats, deers and a bunny which bit her.They also have a butterfly garden. My father loved the peacocks, he would make noises so the they would show they beautiful feathers. We also petted the tigers who out of the blue sprayed pee on a boy who was looking through the cages. We went back to the city after to buy pasalubongs. 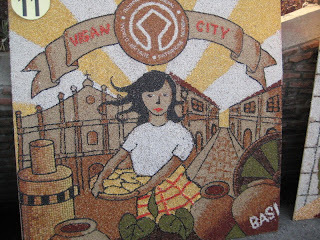 My sis and I took a Calesa ride to Bantay Tower, at the town across Vigan. You can view 360 degrees periphery of Ilocos Norte, from the Cordilleras to the South China Sea. The bell was reconstructed and portion of the church also. 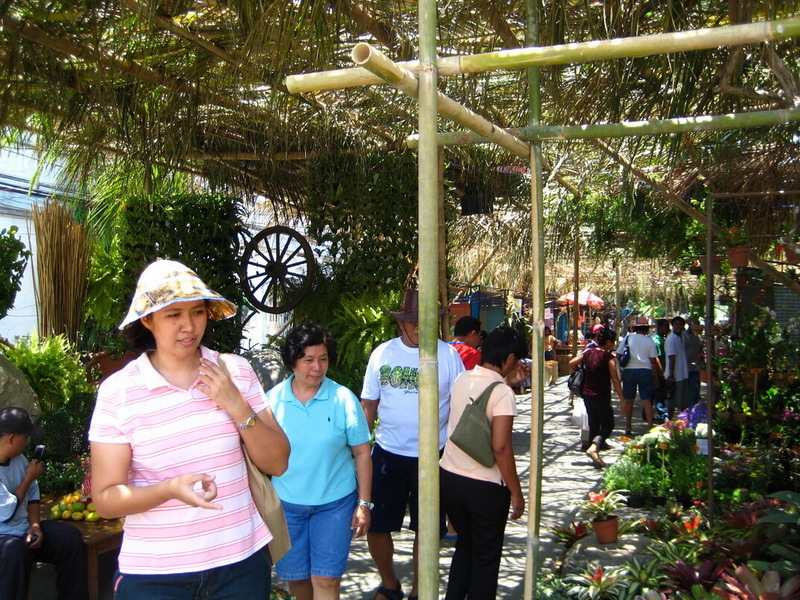 We went to Paburnayan. Ilocos sur is known for their pottery. My sis even got to try to make one, she said it seemed easy but it's tough. That afternoon, we got to watch the street dancing which they call Binatbatan.